This is turning into an extraordinary election year in the midst of an extraordinary social crisis. The party establishments that control the Democratic and Republican parties on behalf of the corporate ruling class have lost control of the script–at least temporarily. Commentators like to portray Sanders and Donald Trump as symmetrical “populist outsiders” responding to working class anger and frustration. But while Bernie Sanders appeals to traditions of social solidarity and shared responsibility for resolving the disasters facing our society, Trump taps into the worst instincts of scapegoating “Others”–Muslims, immigrants, and any other convenient targets. No wonder that open white-supremacists and “nationalists” see Trump’s campaign as an opening for their politics of racism and hatred. 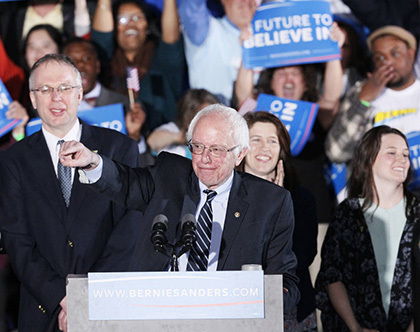 Bernie Sanders delivers a victory speech in New Hampshire. By contrast, the youth and working class energy that fuels Sanders’ campaign illustrates the profound attraction of his program for single-payer health care, expanded social security, tuition-free public universities, a $15 minimum wage, and “political revolution” against Wall Street and “too big to exist” banks. All of this suggests that America is not in the midst of a mass popular turn to the right. The turnout of young first-time voters in Iowa stunned the pundits. On the Democratic side, by some estimates as many as 80% came out for Bernie. (On perhaps a smaller but still significant scale, young people especially on campuses showed up for the Republican caucuses too – maybe for similar reasons on both sides, seeing their futures stuck in the mud of job insecurity and crushing debt.) By the night of the New Hampshire primary, everyone understood that young people were voting heavily for Sanders–including young women, in the face of tone-deaf demands from Gloria Steinem and Madeline Albright about their “duty” to support Clinton. Among working class Americans, Labor for Bernie is also showing strength. While a number of unions plunged into early endorsements for Clinton, without taking the time or trouble to see how their members might feel, the AFL-CIO hasn’t yet done so, surely in part because of pro-Sanders sentiment within significant sectors of labor. The United Auto Workers says it’s surveying the union’s membership, which UAW president Dennis Williams describes as “conflicted.” Labor for Bernie’s April 1 national meeting at the beginning of the Labor Notes conference in Chicago promises to be an exciting event! Despite all the excitement and early momentum, however, the Democratic party establishment is 99% convinced that the avowed democratic socialist is not electable–and one percent utterly terrified that he just might be, in view of what might emerge from the Republican rat pack. But whatever the outcome of the primary contests, a political revolution against “the billionaire class,” or what the Occupy movement called “the one percent”–the corporate capitalist ruling class–will not take place within the confines of a party ultimately owned and controlled by that class. Whatever the sound and fury emanating from the nomination process, corporate America, the banks, Wall Street, and the hedge funds can be sure that the Democratic Party remains in safe hands. They prospered under Bill Clinton and Barack Obama, as they did under George W. Bush in between, and the heated rhetoric of a political campaign won’t change the reality that, as Sanders has pithily put it, “it’s Wall Street that regulates Congress.” The plain fact is that it regulates the Democratic Party too, which is precisely why Bernie Sanders himself has been running as a political independent for decades. These are the open questions for discussion among hundreds of thousands of folks who are “feeling the Bern.” Like others on the socialist left, Solidarity hopes to be part of that exploration. For a free copy of a pamphlet on “The Two-Party System in the United States: Its Origins and Evolution in the Service of Power, Privilege and Capital,” send a note to our office staff at cfc@igc.org and we’ll mail it to you!